We nearly fell off our seats when they announced our names as finalists. We found out later that we had been 4th at that stage. The rest of the day seemed very long before the final at 9.00 p.m. We sang “Jeepers Creepers” and “Each Time I fall in love”. All our scores were better than last year and we came 6th. Not long now until the beer. We listened to all the results and congratulated our fellow competitors. Then they announced “The Most Improved Quartet”…it was us! And this year Elaine made it onto stage! Best Novice Quartet – It’s Official! 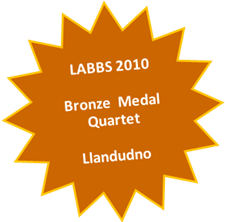 At the LABBS 2007 Convention in Bournemouth we competed amongst 15 ladies quartets in the semi-finals. We sang “This Little Piggy” and “Swinging on a Star” and we won the BLUE CHORDS TROPHY for the best Novice Quartet! Elaine missed the presentation. She was in bed having eaten dodgy mussels! New Lead! Our new lead is called Lindsey Marr. She is in fact the old lead in a new guise, having got married! The quartet all went to the wedding (well Elaine is her mother!) and sang “Don’t blame me” to the groom. We wish Steve and Lindsey all the best for the future. 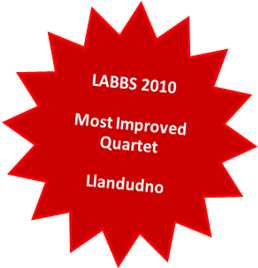 In June 2008 we entered the LABBS so-called “mock” contest (It felt real to us!). We had a terrible morning, as Elaine could only manage a croak, and nearly pulled out. But we persevered, Elaine’s voice got a bit better and we were BOWLED OVER when they announced we had come third! Elaine was able to make it on stage this time (very slowly – dodgy knee!). The weekend was great with some helpful coaching from the judges and a workshop with Havoc and After Hours (current and past gold medal quartets). We sang with our chorus, Silver Lining, at this wonderful village festival. Bowled Over sang 4 songs in our own right, giving “When you say nothing at all” it’s first outing in public (went down very well). It was also the first public performance of an octet comprising Bowled Over and In4mal (also from Silver Lining). We sang “Feeling Groovy” which was perfect in the sunshine.